While we may roll in the aisles with her humorous antics on screen and marvel at the painstaking road she took to achieve success, Pokwang (Marietta Subong in real life) bears a deep burden. One that she carries throughout her otherwise fantastic showbiz journey that keeps her downtrodden and tearful, especially when she guests at talk shows or variety programs that celebrate the heroism and sacrifice of motherhood. That in one tragic September day in 1998, when she was at the throes of making both ends meet as an OFW in Abu Dhabi, the worst news a mother could get came. She learned that her five-year-old son Shin, her child with a Japanese boyfriend, had succumbed to brain cancer just over a month after it was discovered. “June kasi ako umalis, pero August nung pina-CT scan siya. Doon na nakita. Then September 23 namatay na siya,” Pokwang tearfully narrated on Kris TV. And, as she bawled in grief thousands of miles away, she could not come back to attend the funeral because her employer would not allow her. In a separate chat with ABS-CBN’s Anthony Taberna in Tapatan Ni Tunying in 2014, Pokwang further expressed her frustration of not being there for her dead son. “Dapat nandoon ako, dadamayan ko siya,” she said. Pokwang said in his short life, Shin expressed his fervent desire to be a pilot. "Mahilig 'yun magpabili kasi ng mga eroplano. Lumipad naman po siya bilang anghel." In her four-storey house in Antipolo City, Pokwang allotted a “room” for Shin where she puts mementoes about her late son. But even though the grief remains in her heart, Pokwang said she continues to be strong for the sake of her other child, Ria Mae, who was sired by a Japanese while she was working in Japan. She said as a result of losing Shin, she became overprotective of Ria Mae, with whom she has a special mother-daughter closeness. This motivated Pokwang to reach stellar heights in her 12-year showbiz career that started when she won the “Clown in a Million” segment of Yes, Yes Show in 2004. She had since become a bankable Kapamilya talent in top rating TV shows, teleseryes, and blockbuster films. One of her most noteworthy projects was the 2014 TFC film Edsa Woolworth set in the US that earned her praise in the acting craft. During the filming, a romance blossomed with co-star Lee O’Brien, who literally dropped everything in US just to be with Pokwang “for good” in the Philippines. As they settled in the country, it didn’t take long before Pokwang received news that she had hoped to fill the void her late son Shin left in her heart. She learned she was pregnant. Yet, only a short time after the euphoria, Pokwang experienced yet another moment of grief and torment reminiscent of the pain and anguish she suffered when Shin died. Pokwang lost her baby with Lee in an unfortunate miscarriage. What was glaringly different from the tragedy she went through eighteen years ago was the presence of someone who truly loves her was by her side to guide and comfort her. 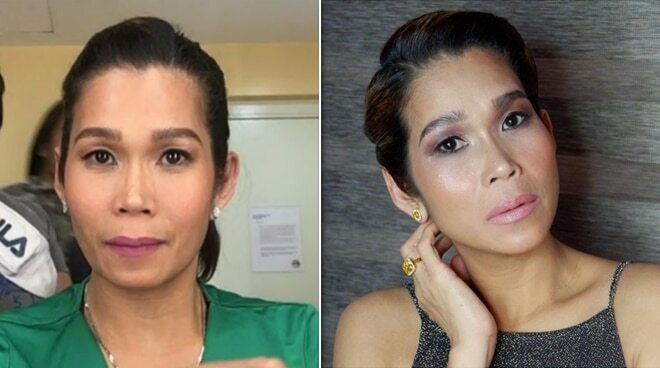 “Nandiyan siya, hindi siya umaalis sa tabi ko,” Pokwang said. “Alam mo ‘yon, lagi akong sinasabihan na, ‘Huwag kang [mag-alala] nandito lang ako. Hindi kita iiwan kahit ano’ng mangyari. Pokwang and Lee’s relationship has never been stronger, as they plan to get married this year and build a happy family. Her career has also never been as thriving, with a lead starring role in the feel good primetime teleserye We Will Survive.